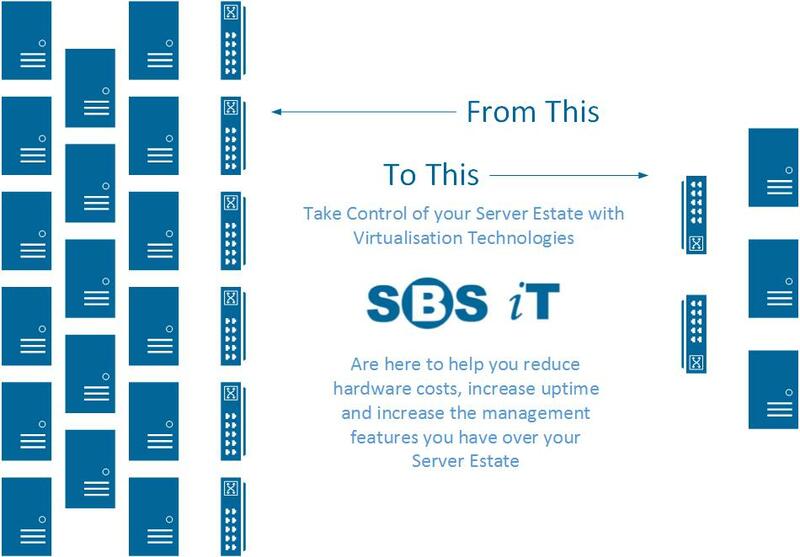 Transform your Server Estate with SBS IT and Virtualisation Technologies. Increase Uptime, reduce operational costs, Increase Control, reduce Hardware expenditure, add High Availability features and Disaster Recover options. SBS IT can help you achieve this and much, much more. Virtualisation is a huge part of modern day technology with benefits ranging from money saving to increased management over your environment. Gone are the days of every server requiring it’s own physical server, power source, network ports or the capacity planning required to add a server to your server room from a cooling or infrastructure point of view. Virtualisation technologies have significantly moved the goal posts for datacenters and server rooms across the world. Administrators now have more control over server estates and further abilities to significantly reduce down time, especially for hardware maintenance and costs. Virtualisation technologies don’t end at the server estates though, with Desktop (VDI) and Storage Virtualisation now common in most server rooms there is the chance to make major changes with Virtualisation technologies. SBS IT can assist with the Design, Implementation, Maintenance and Upgrading of businesses using or wanting to use Virtualisation Technologies. As Partners of VMware, Microsoft and Veeam we can also help you with any licensing renewals you may have for your existing Virtualised Estates, so please get in touch with us for any pricing requirements here. Want to get more out of your Virtualised Environment? Ask us for advice on solutions which may improve your setup or additional features you may want to add to your environment.